Pacific Coastal Airlines has flights from Vancouver and Port Hardy daily. 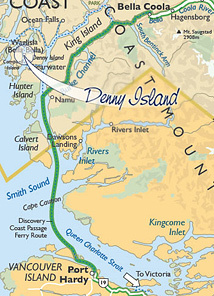 As well, Denny Island boasts its very own 3000’ paved runway, so if you have your own bird, arrive at your leisure! If you're arriving by ferry, you'll be traveling on BC Ferries. Contact BC Ferries for updated schedules and reservation information. Denny Island and its surrounding area have many safe and secluded anchorages, in addition to private dock space available for pleasure craft. Reservations at the marina are recommended through the summer months.